A simple graph shows the system. 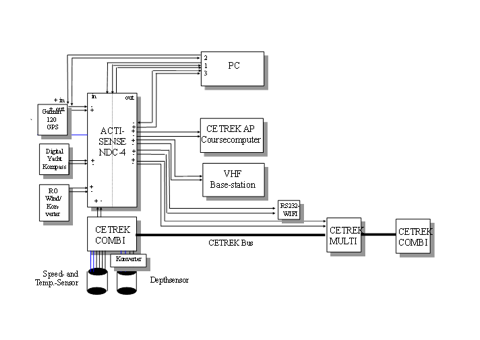 Note three NMEA lines from the PC, which are for a) supplying data to the system, b= directly linking the PC to the PS for uploading waypoints using the GARMIN protocol and c) for programming the Multiplexer. Line b) and c) may be left out. Power lines have been omitted for clarity. The AIS on board has been omitted as well.